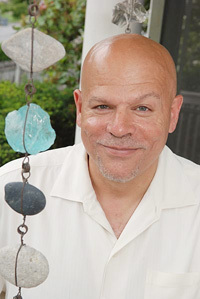 Rick Benjamin is the State Poet of Rhode Island. He teaches or has taught at Brown University, the Rhode Island School of Design, the MFA Program in Interdisciplinary Arts at Goddard College, in many schools, and in community & assisted living centers — where he has passed good time in the company of people who range in age from six to ninety-six. He also serves as a Fellow at New Urban Arts — an afterschool arts mentoring program for Providence high school students. His poems & essays have appeared in PRØOF, Watershed, The Providence Journal, Tongue, 350.org, The Writer’s Circle, American Poets in the 21st Century: The New Poetics (Wesleyan University Press), Urthona: An International Buddhist Journal of the Arts, Poem, Home: An Anthology of Ars Poetica (Paper Kite Press), and La Petite Zine. He lives with his family in a very small village in the smallest state. J. Dee Cochran: In Passing Love, poems like “Delivery” and “Dream of My Twin’s Allergic Reaction” complicate the idea of self through the idea of twin(s). “Delivery” starts with ants crawling over the twin children and ends with the wonderful lines, “…witnessing my stings/in your eyes, I do not remember/which of us cried first.” Could you talk about how being a twin has influenced your relationship to language? Rick Benjamin: You are the first person to ask this question, one that speaks to so much of my work, I think. Twinship—I am a twin who also has twin sons of his own—is a very formative aspect of both my identity & creative process: one of my earliest images is of sitting in a bathtub with my brother, splashing, laughing, & being wholly unaware of selfhood involving a single identity. I gravitate toward duplicity in language, simply stated multiple meanings in lines. I have a hard time with differentiating self from other. What happens to me must also be happening to someone else simultaneously; language finding its way into form feels to me like finding kindred spirits. It is a very fluid rather than fixed medium for me, & poems have always provided a means for discovering, in any moment, what that kind of identity (communal rather than individual) might mean. JDC: “Work” is a beautiful poem, written mostly in couplets, which emphasizes the motif of hands–that turn over stones or raise a cup to a dying mother’s lips. After reading the poem, I wondered what specific jobs prefaced your life as poet and if these positions induced a need for creative work. Do any stand out in your mind as igniting a need for poetic consciousness and expression? RB: This is also such an interesting & provocative question. I suppose anyone in his fifties has, by now, held many jobs. “Work” takes place in a hospital, & I worked in one once: I used to spend some of my breaks in Labor & Delivery, wondering at the fact that so many babies arrived looking old & wrinkled, as if at the end rather than the beginning of something; that was a formative observation. I have worked as a janitor in a strip-mall—that taught me that I needed to treat all labors with the same quality of attention: how one cleans a toilet or does the dishes matters as much as how one enters a poem. I spent many years working in the non-profit sector, doing meaningful work that had little effect in terms of alleviating suffering. I am now more suspicious of organizations & efforts that seek to systematize solutions for simple challenges, like, say, providing support & solace. These days everything I do, creatively & otherwise, involves me in building communities with others: teaching, facilitating workshops with elders, thirteen year olds, high school students, being a fellow (read: building relationships) at a local community arts-education organization), writing with others—all of these keep me grounded in very direct, non-precious way of working. JDC: Lucille Clifton, Adrienne Rich, Ruth Stone, Robert Hass, and Kevin Young are some of your favorite contemporary poets. Are there also prose writers who influence your poetry and/or thought process? RB: Yes. Virginia Woolf, Gabriel Garcia Marquez & Toni Morrison all immediately come to mind. Woolf was an early example to me of a prose-writer whose thinking could be so compressed that it in turn pressed language into lyrical & musical terrain. I respond to resonances, reverberations, sonic depths of all kinds. I deeply appreciate writers whose work is invested in plumbing depths with sounds & images, with sensations as much as thought. I can still be utterly transported by any one of her books in precisely this way. Her work tends always toward the transcendent. This is, I suppose, more literally true of Marquez’s work. Though many people have talked about his surrealistic tendencies, I tend to think of this kind of “magic” in language as the way the world simply is, which is also to say, “uncanny” & “mysterious.” It was so important in my early twenties to come upon a writer whose representations of reality actually stretched the possibilities for what it meant to be human. Like Woolf, who she credits with influencing her own work, Toni Morrison writes prose like a poet. She has a near-perfect ear & you can hear it in almost every one of her sentences. Though her creative life has moved from one of being a consummate story-teller in the novel form (Song of Solomon is the best example of this trait) to a slighter, more suggestive teller of tales, I gratefully receive & read all of her books. She needs language less now; I can, myself, feel that impulse as I grow older: the desire to distill life experience as well as the more ineffable aspects of being human into something almost evanescent. JDC: One of your goals as Rhode Island’s Poet Laureate is to initiate a statewide poets-in-the-schools program. As you work toward that goal, what challenges do you face? RB: Funding, first & foremost, though, to be honest, I think the money required for such an endeavor is modest. I’m also quite interested & invested in creating opportunities for teachers to get back to their own work as poets & writers, by offering free workshops (over extended periods of time) each spring designed to both further their own learning & take seriously their own work & passions. Again, I think the funding needed for such an undertaking is minimal, though I do believe that all artists should be well compensated for facilitating workshops of any kind! New initiatives, like Rhode Island Teaching Artist Center (RITAC), are promising steps in my hopes for statewide programs that engage poets of all ages in many different settings, including schools. JDC: Admirably, your work as a poet coexists with your work in the community. Having worked with high school students and elders, I’m wondering if you observe generational differences in how poetry is received and/or practiced? RB: This question makes me smile, as I remember that, four years ago, when I first started working with this group of elders at an assisted living center, they reminded me very much of high school students. All of them were reluctant to write, just about everyone professed to dislike poetry. I encountered multiple resistances to my offerings of poetry & opportunities for poetic expression. Just like walking into most high school classrooms! But, of course, I also love this particular challenge & don’t find it particularly daunting. Most people only think they dislike poetry. It’s easy, most of the time, to demonstrate why it’s wise & relevant & of benefit in a human life. Though I’m not a spoken-word poet, I believe always in giving voice to poetry. I offer up poems in the oral tradition, very much as if they are just part of a large & long conversation. That helps with elders (many of whom don’t see so well any more) and with high school students (many of whom are simply wary of passing more paper around). In each case I am always interested to see how much we can accomplish in perversely small increments of time (maybe we only have 25 minutes to write together!) while honoring fully the lives we are bringing to the table. So I say, fast & loose, &, say, about ninety years or so at the assisted living center; & I remind high school students that 45 minutes is also being added to, say, seventeen years. That’s a long time to simmer—no use wasting our time together wishing it was longer! JDC: “Justice, truth, and beauty are sisters and comrades. With these three such beautiful words we have no need to look for any others.” In Human Personality, Simone Weil noted these words as the most essential to her life and work. If you were forced to pick three such words, what might they be and why? RB: Again, this is such a lovely question. I don’t know how I can offer up anything better than what Weil says. But, in the interests of candor, my three words would be, “curiosity, love, & mystery”—in this companionable linguistic space is also the room for more fully evolving, for living in more enlightened ways, & for stretching toward something more life-affirming generally on this planet in our lives & work. JDC: Of all the poems you have written, do you have a favorite? If so, could you share a few lines from it and why it has a special place within your body of work? RB: O, no! What Christopher Lydon calls his Proust questions! I am unable even to come up with even a favorite meal, movie or book. I have many favorites of everything. This would go better if you asked me to name fifty poems of my own that I like. But in the interests of at least trying to answer your question, I am thinking at this very moment of the closing lines of a poem called “A Superhero” in Floating World, which I think of from time to time: “Solace comes when called/to the occasion, reaching into the wound/of the body that will also betray you.” Callings that are also at once ultimate sacrifices, acknowledgements that the self is inextricably bound with the lives of others. Twinship! JDC: How was the experience of writing Floating World different from writing Passing Love? RB: Very different. For one thing, my editors immediately cut 23 poems from the book which they felt belonged in another book (& which is now turning out to be true). I thought I had a very clear trajectory at that point in terms of moving back & forth between the mystical & the mundane. The shorter book I was thrown back into working with feels like a different creature, one that surprised me when it finally “arrived.” Passing Love, on the other hand, while it went through many stages of revision & editing, was clear to me from the beginning in both its structure & content, & remained so. Incidentally, the last poem in Passing Love is called “Ukiyo-e,” which roughly translates from the Japanese into “floating world,” emphasizing impermanence, the fleeting qualities of a human life, evanescence. I kind of like picking up where I’d left off. JDC: While revising your poems are there certain people who you consult to give you feedback? What does your revision process look like? RB: Yes. The poet, Shin Yu Pai is one of my first readers, as is the writer (& one of my former students), Sara Nolan. I trust both of them completely to respond honestly & astutely to my work. I love revising. For me it is a way of visiting all the things in a poem that I didn’t already know about, of honoring the unconscious. I generally trust that the raw material gets out in the drafting process, but that I won’t know what it really means until I’ve engaged in a process of revision. Revising is exciting, edge-of-seat suspenseful: I can’t wait to find out what I was really getting at. JDC: One gets the sense while reading your poetry that the spirit is as important (if not more important) as the physical body. Do you subscribe to a belief system? If so, how does this enhance your poetic terrain? RB: I’m not sure that I differentiate any more between body & spirit, except, perhaps, to recognize that one goes on while the other invariably disintegrates or reintegrates (like something composting into some new state of becoming). When I was a boy I had the capacity to leave my body during times of brutality, which led me to experience a kind of body-spirit split, but my adult life has been full of moments where the two have been remarkably in concert, even companionable. I am a practicing Buddhist, by the way, & of course this informs my creative life (& vice-versa), though I am interested in the mystical in just about any faith tradition. JDC: What are you working on now? Do you anticipate another book any time soon? RB: I am simultaneously working now on two new books: one is a new book of poetry, the other is about the work that poetry helps us to do in our lives. The first is nearly done & in a process of shaping (which means that it might arrive on someone’s bed-side table two years from now—ah, the vagaries of publishing! The other is ongoing. My monthly newspaper column means that I am almost always writing (or at least thinking about) this other book, but it might also mean that I’m going to be at it for quite a while. Posted in Author Interviews and tagged Adrienne Rich, New England Writers, Poets, Rick Benjamin. Bookmark the permalink. Trackbacks are closed, but you can post a comment.